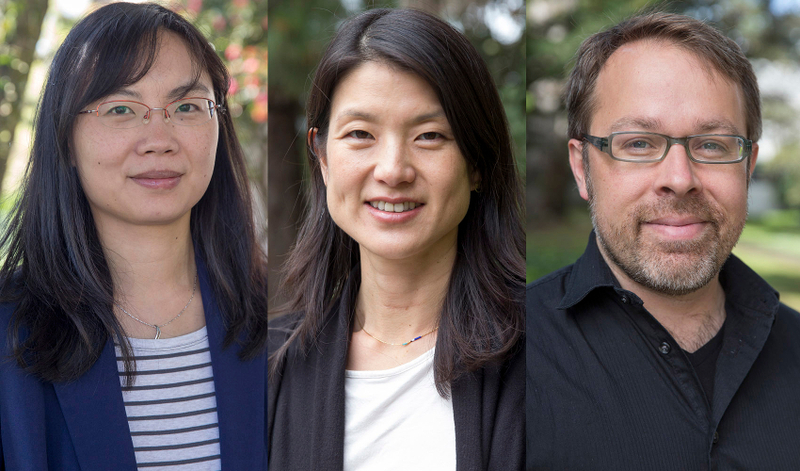 Three San Francisco State University faculty members have been given the National Science Foundation’s (NSF’s) prestigious CAREER award this year: Assistant Professor of Computer Engineering Xiaorong Zhang and Assistant Professors of Biology Andrea Swei and Scott Roy. The five-year award supports early-career faculty who have the potential to be leaders in both research and education. San Francisco State leads the California State University system in these awards, with 17 winners since the program’s inception in 1996. All three of this year’s awardees, in SF State tradition, have ambitious plans to combine their research with the education of the next generation of STEM students in the lab, the classroom and beyond. Read on to learn more about each of these young academic stars and their visions for the next five years. Everyday motions may feel simple, but even the most mundane tasks can require lots of coordination. “When you feel thirsty and want to grab a cup of water, it takes a series of continuous and dynamic motions,” Zhang explained. Current prosthetic technology — which only allows for simple motions and often requires manual control — is a long way away from replicating that. Zhang’s work may pave the way toward creating a prosthetic with the subtlety and precision of a human hand. Her aim is to develop hardware and software for “neural-machine interfaces”: computer systems that gather and interpret electric signals from the human muscles using a grid of sensors. The technology could find use in next-generation prosthetics that sense a user’s intentions, wheelchairs or even next-generation virtual reality video games. But there are some formidable roadblocks. Any such system will have to handle large amounts of data while still being energy- and memory-efficient enough to be carried around, both challenges Zhang plans to tackle. At the same time, Zhang is working to transform the computer engineering curriculum at SF State. She’s proposed two new courses on computer systems — one undergraduate and one graduate — and will be broadcasting a graduate course online to fill what she sees as a gap in public education on interfaces between humans and computers. Another of her plans is to recruit student researchers from nearby community colleges that offer few research opportunities, and she also hopes to hold a yearly workshop with students from nearby high schools and community colleges. Depending on where you live, a hike in the woods may put you at risk of Lyme disease from a tick bite. But what makes one area riskier than another? That’s the focus of Swei’s research. She’ll be studying the groups of species that ticks like to feed on — from lizards to rodents and even larger mammals — throughout the Bay Area. “We plan to ask what impact that has on tick abundance and prevalence,” she explained. That research is part of her larger quest to understand how the natural context of host species affect the spread and persistence of diseases. Asking questions like these is a crucial step toward understanding why the risk of Lyme varies from place to place and could help explain why, for instance, a hiker in California has a much lower risk of contracting the disease than one in Pennsylvania. Along with her focus on Lyme, Swei’s lab will examine a few less-famous diseases that humans can contract from ticks. To read DNA, molecular machinery inside cells has to cut out and piece together the meaningful sections around the “junk,” a complicated process that in the past has led to the evolution of new ways of translating DNA into other, useful molecules. Scientists have looked closely at this process in only a handful of species. Roy plans to change that by analyzing the genetic material of 300 species, focusing on the more unexplored branches of the tree of life. He’ll look for organisms that have found unique ways to ignore the gibberish — and keep an eye out for bigger patterns in how organisms get around the constraints of their own DNA. Also on Roy’s agenda: ensuring more students have the opportunity to experience lab research. Each year, he plans to recruit a team of about 20 students from SF State and local community colleges to help look for interesting patterns in the data produced by his lab. They’ll work in small groups, mentored by graduate students and Roy, and gain research experience along the way. “That’s so crucially important to developing as a scientist,” he said. He’ll also be developing a seminar series in the hopes of growing a community of biologists at SF State interested in the computer-based side of the discipline.